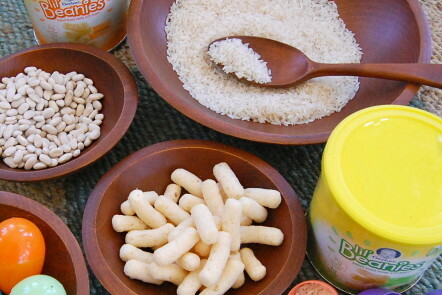 I was hired by The Women Bloggers to participate in this campaign led by Kendal King Group on behalf of Nestle. All words and opinions are my own. Now that Easter is over, you may be looking for something to do with all of those eggs, both the hard boiled variety and the plastic. I am sure there are plenty of recipes to enjoy with the former (avocado egg salad, anyone? ), but I am here to talk about what to do with the plastic ones. 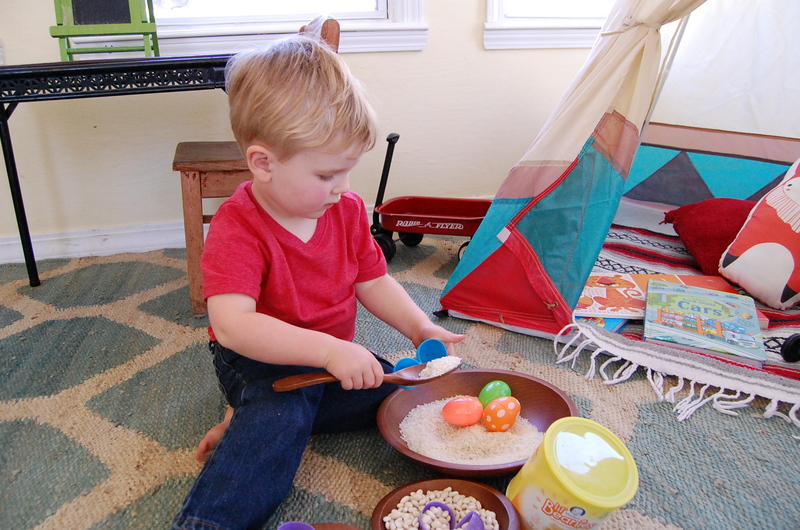 We are all about reusing and repurposing around here so I put together a fun, sensory activity that also involves making a little music. And, even if you don’t allow many sweets, you may have let your little one indulge in some sugary treats over the weekend as well. I am thinking you may be looking for a healthy snack to balance things out after the sugar rush (hey, same here). I have just the thing for that too! 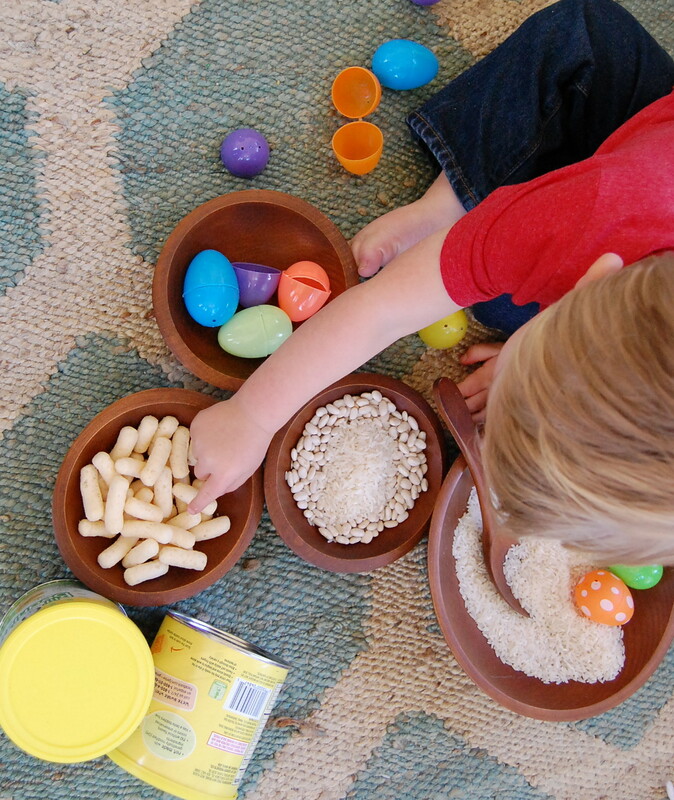 While Young Master Gray was napping, I set out an invitation to play with dried rice, dried white beans and empty plastic Easter eggs. 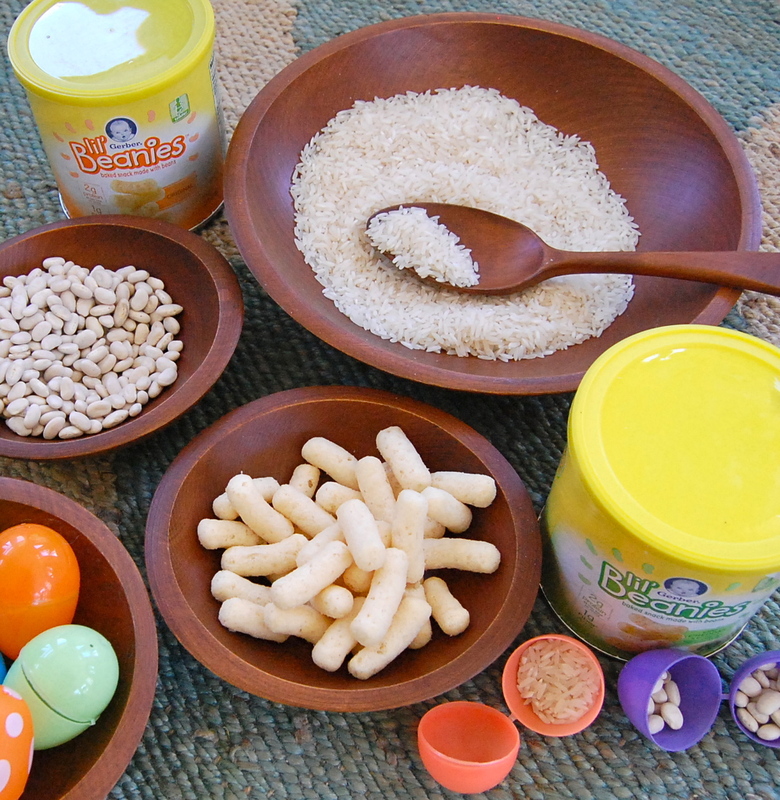 The object was for him to fill the eggs with the rice and beans to make shakers, but also to touch and experience all of the different textures. I also set out a snack for him to munch on as we played. 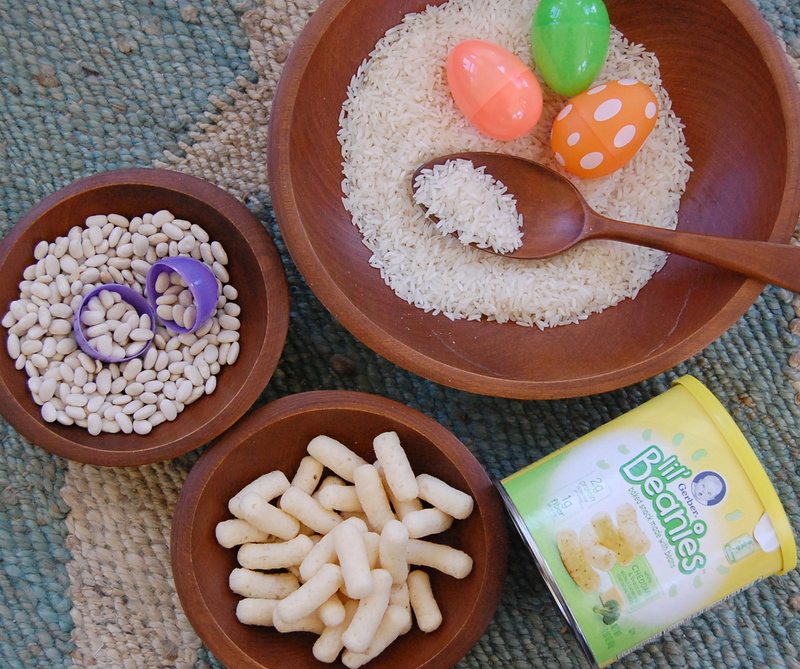 Gerber Lil’ Beanies are a brand new snack for toddlers made from navy beans and rice flour, so there was an added element of talking about what our snack was made of as we played with the main ingredients! There are only seven ingredients listed on the can of the original flavor with sea salt which makes thislabel-reading mama happy! 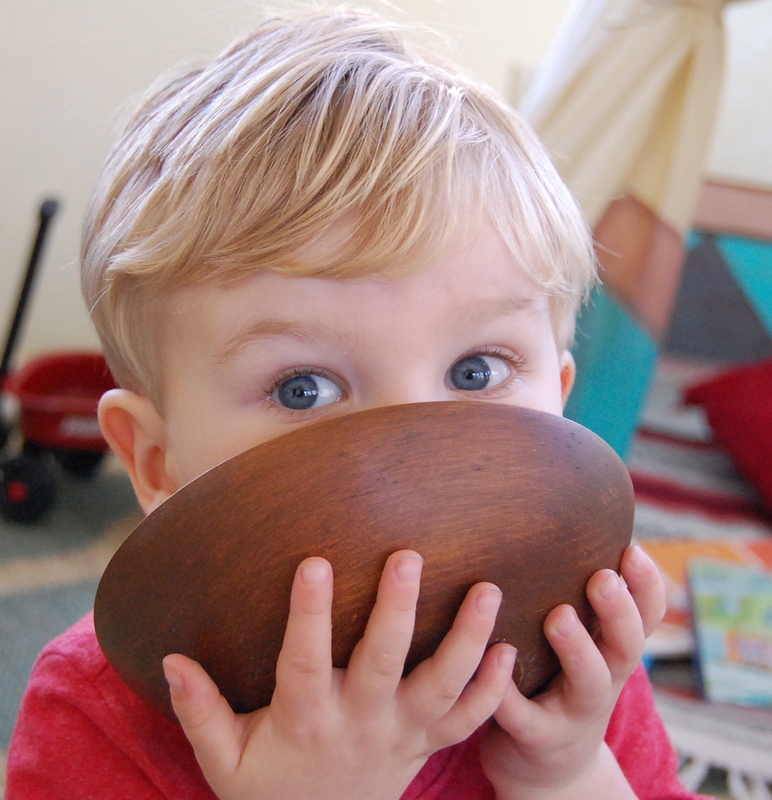 If you or your kids have food allergies like we do (or if you are just health conscious), you know that what is left out is just as important as what is in the food you give your kids. I was thrilled to learn that Lil’ Beanies are not made with GMOs, and do not contain artificial flavors, colors or preservatives. Because Young Master Gray cannot have dairy, I left the White Cheddar and Broccoli flavored Lil’ Beanies in the can. Just out of curiosity, I had a taste of them for myself. They were really good! I may or may not have finished off a whole can (hey, he can’t eat them anyway). They reminded me of cheese puffs, but they didn’t leave a whole lot of messy cheese and powder on my fingers, a big plus for a toddler snack! When Young Master Gray woke up, he dove right into the activity! And he dove right into the Lil’ Beanies as well! 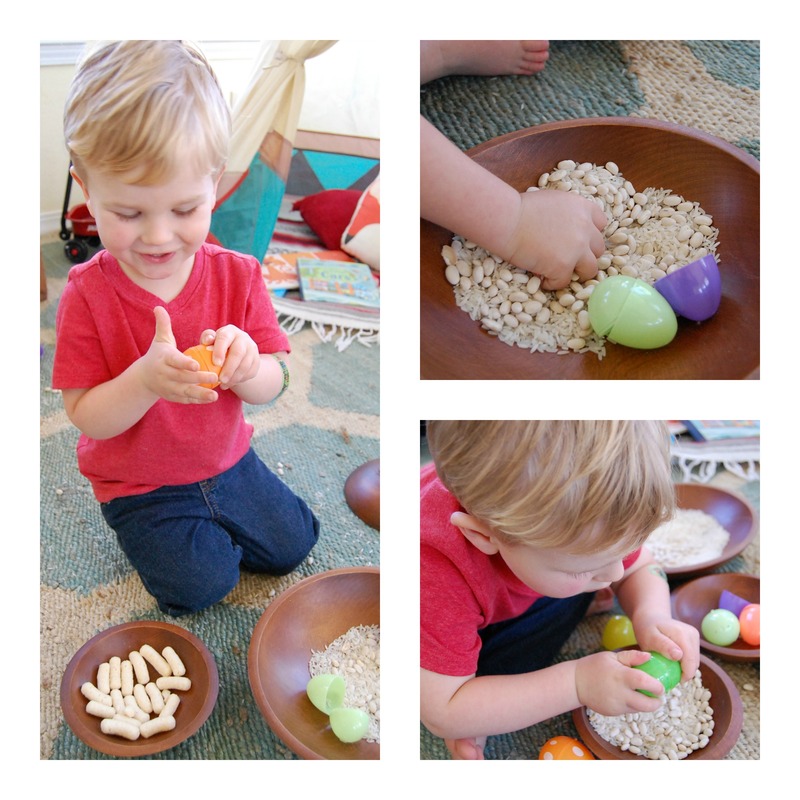 We experimented with filling the eggs with rice and then beans to see how different they sounded when we shook them. 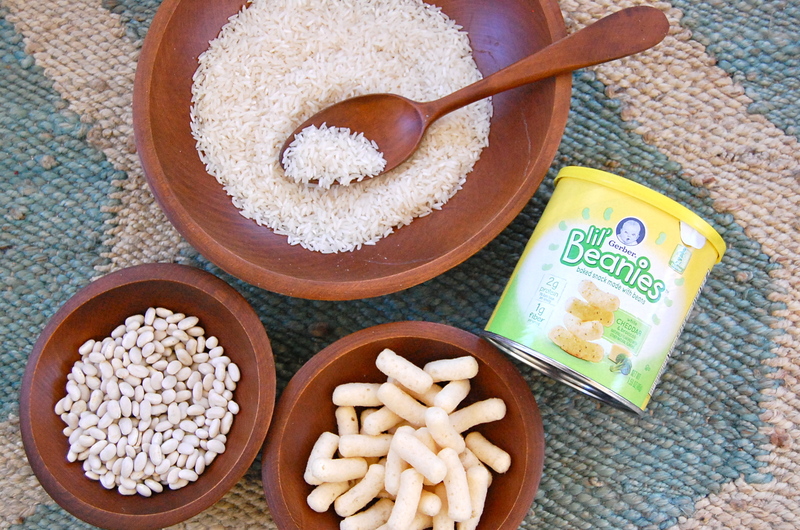 It didn’t take long for the beans and rice to get mixed together, so we filled some eggs with both rice and beans. Overall, it was a really fun activity that kept him interested for quite a while (major win!). He is still talking about it today. 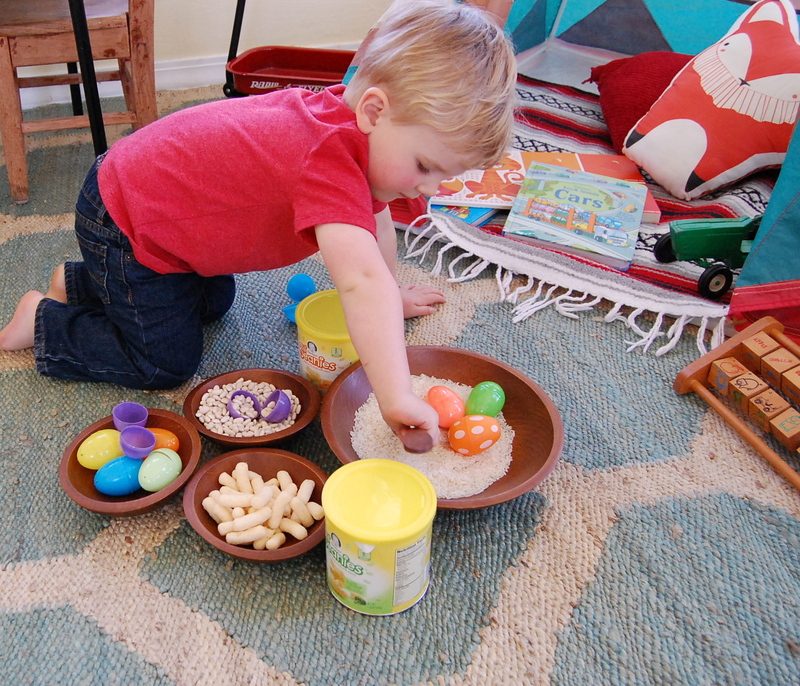 I taped up some of the eggs afterwards so that we could continue using them as shakers in our everyday play. I am sure that I will still be finding rice in my rug for weeks to come, but all the fun we had outweighed the inconvenience of a little mess. Luckily the Lil’ Beanies didn’t add to the mess at all. Young Master Gray says, “Sorry! I didn’t save any Lil’ Beanies for you!” However, you should be able to find them in the baby and toddler snack section at Walmart! Let me know if you try the activity or the snacks! I would love to hear how your toddlers like them!